I did a little project for the Classic Elite Web-Letter last week. It's a one-skeiner and was conceived as a solution for maximizing that little bit of luxury fiber you may have hiding somewhere but have been too afraid to touch. I had a skein of Classic Elite's Stormy (cashmere tweed... 'nuff said) and whipped this up - I think it's going to get a lot of neckplay this year! The pattern is available HERE [Ravel it] and is written for two different sizes/styles - both shown here. Each piece is knit at a slightly different gauge - the Rust version is knit on US 8's at 14 sts to 4 inches in Brioche Stitch for a firmer fabric that acts more as a faux stand-up collar and looks great under a jacket or sports coat (You may just fake someone into thinking you're wearing an entire cashmere sweater...) The purple version is knit on needles two sizes larger for a fabric with a bit more drape with added length for a more slouchy, voluminous style. Wearer's choice! A word of warning about Brioche - the stitch pattern takes a little knitting to become visible. Blindly knit forward for that first inch or so, though, and you'll see the tell-tale ribbing start to appear. Here's an idea I love - for the really cold-weather days that will be here before we know it, I like wearing these under wool scarves. 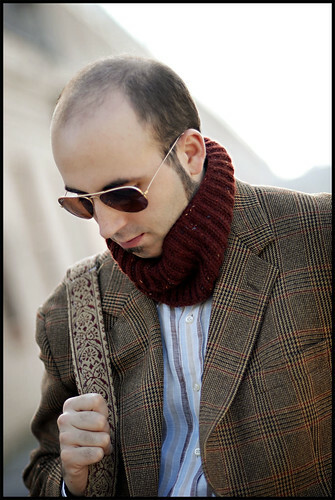 You get the best of both worlds - rugged, woolie neckwear with a cashmere secret for next-to-skin delight. Also, cashmere has that whole 8-times-warmer-than-wool thing going for it, too. The pattern employs some Cast-On and Bind-Off tricks that I like which help compensate for Brioche Stitch's wiiiide gauge - a double stranded Long Tail Cast-On (exactly what it sounds like - Long Tailing with two strands of yarn) makes for added flexibility and a nice edge... and the Sewn Bind-Off (I recommend EZ's) is essential for anything being pulled over our heads (also known as the Sweater Collar Savior). Aren't you loving that we can finally indulge in some beautiful Fall weather? It's really my favorite time of year - you can't beat that beautiful light, and several of my handknits have already gotten some serious street time. Not to mention prime sweater-watching in the city - very inspiring! also: those gorgeous hats and sweaters on your photography site--will we be hearing more about them any time soon? That´s alreday a favourite - thanks for sharing your pattern! Merci pour ce superbe modèle, I like all you patterns ! Porom is on my needles. I love the look of pieces like this, but have never figured out how to wear them for myself. With an opportunity to use a skein of cashmere tweed!, this has to be the perfect time to find out! Wow - a lovely use for brioche stitch. I remember reading an article about knitting it in the round in Vogue Knitting. Very good idea about wearing these under scarves on the cold days - especially here in Chicago! This will make a lovely Christmas gift for a special person I know (for whom I am also making a Red Light Special hat with cashmere lining). You've done it again! Your designs are so classic. This pattern would make a wonderful gift for my older brothers and sister. Something luxurious, useful (we do live in New England! ), and simple enough that it won't give me a knitting headache. You+your blog=Great! So pretty! 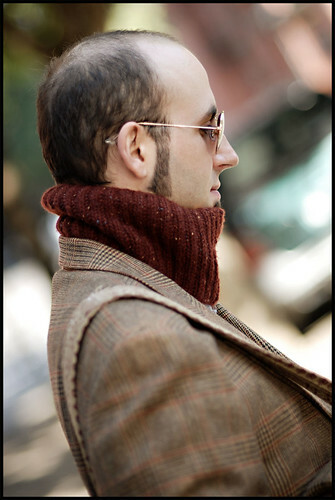 I love the idea of a cashmere neck warmer. I've been coveting a cashmere sweater for some time now - this might do the trick until I can loosen the purse strings a little for the real thing! Beautiful work as usual! I really like the pattern. That's a lovely neckwarmer. I was wondering what to do with a single skein of hand-dyed yarn that I received as a gift. Perfect solution, thanks! Excellent! Love it, love it. Thank you for your efforts to share with your fans. The models are perfect, as well. I completely agree about the weather! I've just started a little scarf in Classic Elite alpaca with some lovely autumnal colors. It's been too hot before now to work on anything larger than socks and fingerless gloves. i was just thinking of a brioche stitch scarf for fall, but this neckwarmer should do the job...and i could use stash yarn = perfect! Did you know that Morningside is a suburb of Edinburgh, Scotland (where I originate from) - don't know if you named this after it! It has a reputation of being rather posh (like you lovely neckwarmer) but the cold winds whip down there like anywhere else in Edinburgh in the autumn/winter. Your neckwarmer will offer wonderful protection! in my queue already! 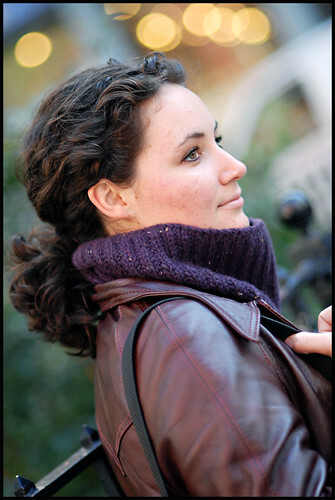 nothing like a gorgeous fall cowl. This is brilliant! Having reached the is-it-hot-in-here-or-is-it-just-me stage of life, I was wishing just today that all my slouchy turtleneck sweaters had removable necks. Now I can turn all my crew neck sweaters into two-part turtlenecks--I'm starting one tonight. I've been wearing something like this for a few winters now--though not nearly so posh!--and as a dweller in a very cold climate whio tends to heat up when I get working outside, this type of thing has been GREAT in that it fits into a pocket when not needed and can't fall off: my great (and justified) fear in wearing loved scarves. I LOVE the fact that I can cowl it right up around my face in nasty weather, and scrunch it down around my collarbones when it warms up. And you're right, a bit of luxury fiber next to some of your most sensitive skin is a wonderful encouragement when getting geared up to head Outside into serious cold...thanks for the expanded pattern idea! As always, you have taken a simple thing (cowl!) and incorporated all sorts of fun ideas. You've got me thinking about different cast-ons and bind-off than I'm used to, and maybe I will finally try brioche. Thanks!! Fantastic! Another quick beautiful pattern for Christmas. Thanks! Thank you again for a classic, timeless, elegant & of course beautifully photographed project to warm us up this winter. They look great and a fabulous idea to keep warm without the bulk. Thank you (again) for a lovely pattern just in time for fall's cool days! 'Can't wait to try your cast on and bind off suggestions! well, your followers are only too happy to get some patterns for some beautiful knitting. i am knitting poroms like crazy and wondering what the word means. the best are most definitely in jamieson's but it seems to be more difficult to get hold on than white truffles. i like the cowl a lot. isn't brioche just lovely. i need a briochy tweedy sweater soon. Wow!! You're coming to my neck of the woods... you must be teaching at Yarns Unlimited! Woot Woot!! I will definitely make! After all, who doesn't love one skeiners! Sensational!!!! You have a way with colors!!!! Very elegant -- brioche has such a lovely texture, and that yarn looks scrumptious! Another use of this pattern is for those skeins of handspun that may not be quite perfect or large enough for other projects. Brioche is very forgiving. Thanks for the brioche web site. 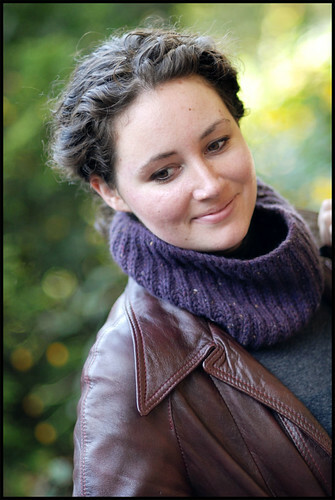 I learned how to do a two color brioche in the round from this web site so am doing your neckwarmer in two colors. Thanks for mentioning that the brioche doesn't look like brioche at first. I guess I can stop ripping now. I enjoy reading your blog every time I stop by. And your designs are fantastic! Thanks (I think) for the wonderful patterns. Now I've got this and Porom to add to the holiday list making it an even 40 items. Time to stop blog reading and start knitting! do you have some other kind of light up there in america? is it a question of camera? is there any trick i don´t know? anyways, i love your blog. and your designs, of course. guess there's no way not to. Dude. You are a genius. 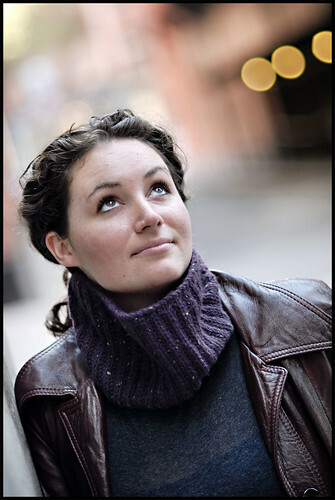 I was just looking for a project to use a particular yarn in the stash and came across "Cobblestone" on Ravelry. Over a thousand projects using your pattern, and the great majority of them look terrific. You have multiple patterns like that, ones that aren't just brilliant when you make them, but which give great results for other people, too. I'm glad you do what you do. it's simply brilliant!! i love it. Ooooohhhh.... pretty. Must. Knit. One. Now. Plugging into your blog is like watching a TV series or movie - everybody you know is so good looking. Even the knitting is hot! omg that is such a good idea!! !